of lighter-than-air aviation. 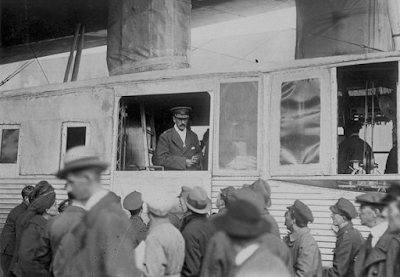 In 1919 Maitland was on board the Airship that completed the first East-West transatlantic crossing. Maitland was commissioned a second-lieutenant in the Essex Regiment in 1900, and served with the 2nd battalion of his regiment in the Orange River Colony during the Second Boer War in South Africa. Maitland took up ballooning in 1908. In November 1908, he flew in a balloon named the Mammoth from Crystal Palace in England to Meeki Derevi, near Novo Aleksandrovsk in Russia. The distance of 1,117 miles was covered in 36 hours. From 1909 Maitland was attached to the Balloon School at Farnborough Airfield. In addition to ballooning, he also experimented with powered aircraft, but following a crash in which he broke both legs he restricted his activities to airships and balloons. In August 1911 Maitland was attached to the Royal Engineers' Air Battalion and appointed Officer Commanding No. 1 Company, Air Battalion. In 1914, when the Army airships were transferred to the Navy, Maitland transferred to the Royal Naval Air Service and in the early months of World War I served with the Dunkirk Squadron, operating captive balloons. Impressed by the kite-balloons being used by the French, he returned to Britain to promote their use to the War Office, and was appointed head of the kite balloon school which was established at Roehampton. In 1916 he was appointed the head of the naval airship station at Pulham. the Royal Air Force. He was subsequently promoted to Air Commodore. at the window) when it completed the first transatlantic crossing. R34 had never been intended as a passenger carrier and extra accommodation was arranged by slinging hammocks in the keel walkway. A plate was allegedly welded to an engine exhaust pipe to allow the preparation of hot food. The crew included the-then Brigadier-General Maitland and Zachary Lansdowne as the representative of the US Navy. R34 left Britain on 2 July 1919 and arrived at Mineola, Long Island, United States, on 6 July after a flight of 108 hours with virtually no fuel left. Footage still exists of the R34 landing in the United States. As the landing party had no experience of handling large rigid airships, Major E. M. Pritchard jumped by parachute and so became the first person to reach American soil by air from Europe. This was the first East-West aerial crossing of the Atlantic and was achieved weeks after the first transatlantic aeroplane flight. The return journey to RNAS Pulham took place from 10 to 13 July and took 75 hours. On 24 August 1921 Maitland was killed when the R38 airship on which he was a passenger suffered structural failure and broke up over the River Humber. He was buried at Western Cemetery in Hull. Information supplied by David Jones.